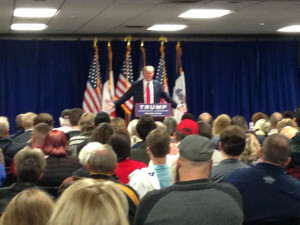 Late this afternoon, Republican presidential candidate Donald Trump went to the Iowa town he first connected with five years ago. In the fall of 2010, Trump telephoned the people he saw featured in a “60 Minutes” story about the demise of Newton’s largest employer. Trump was about 10 minutes late for an hour-long, live interview on WHO TV. The televised forum was focused on jobs and the economy. Trump suggested his standing in the polls is tied to the number of people who cannot find the kind of job they want. Trump briefly steered the TV show conversation away to current events. “What’s happened since Paris is people are really starting to like my hard line on immigration,” Trump said, to applause from the audience gathered to watch the show in the Newton auditorium where Maytag’s final shareholders meeting was held. Trump then took questions from a crowd gathered next door in the same complex. A woman in the crowd asked about Syrian refugees. A few minutes later a man in the crowd asked Trump about rival Ben Carson’s ability to address foreign policy issues. “Is his campaign going to go into free-fall now that it’s been exposed how little he knows?” the man asked. Toward the end of the 40-minute rally, Trump — without prompting from a questioner — criticized rival Marco Rubio for skipping a senate security briefing to attend a campaign fundraiser. Registered Republican voter Chris Bjornson of West Des Moines wore a Trump t-shirt to the event. Andrew Worrell of Kellogg, a registered Republican voter, likes Trump’s “no nonsense” style, but he’s hoping Trump will tone down the attacks on his GOP rivals. Lonnie Appleby of Newton is a registered Democrat who plans to support Trump in the Caucuses. Appleby comes from a family of Democrats — and joked that he doesn’t plan to talk politics over the Thanksgiving table.